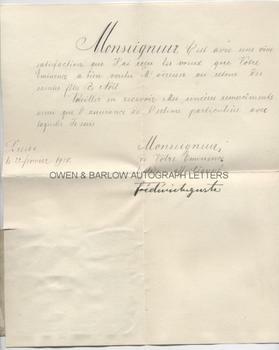 FREDERICK AUGUSTUS III Letter Signed. LS. 1p. Dresden. 22nd February 1910. To an unnamed correspondent but probably Cardinal Pierre-Hector Coullie. Together with a contemporary tinsel portrait post-card. Text in a clerical court hand with autograph signature of Frederick Augustus III (as Frederick Auguste). In French. [Trans] "Monsigneur, it is with great satisfaction that I received the wishes that your Eminence was kind enough to send me for the Holy Christmas festivities. Please receive my sincere reciprocations as well as the assurance of the particular esteem which I hold for you, Monsigneur, your Eminance, with great affection, Frederick Auguste." Quarto. Approx 10.5 x 8.75 inches. With a tinsel type, hand-coloured portrait photograph of the Royal couple affixed to the verso. The portrait measures approx. 4.75 x 3.25 inches. The letter has slight mounting traces to verso. Both are else in fine condition. Frederick Augustus III was the son of King George of Saxony and Maria Anna of Portugal. He served in the Royal Saxon army during World War I and he voluntarily abdicated the throne following the defeat of the Kaiser's Germany in 1918. The monarchy was never restored and he was the last King of Saxony. The photograph shows the King with his consort, Archduchess Luise of Tuscany, although the couple were divorced in 1903. The Queen fled Saxony whilst pregnant with the couple's last child and after her father in law had threatened to have her committed to a mental asylum for life. Emperor Franz-Josef of Austria-Hungary refused to recognise the couple's subsequent divorce. An uncommon autograph. The recipient of the letter is unnamed but from other letters which we have from the sale source it is almost certainly Cardinal Pierre-Hector Coullie (1829-1912) the Roman Catholic Cardinal of Orleans.